Rafael Benitez was always doomed to fail at Chelsea according to his former boss Christian Purslow. The ex-Liverpool manager was appointed on an interim basis in November but, following continued negativity from fans towards him, confirmed he will depart in May. Former Liverpool managing director Purslow is not surprised to see Benitez struggling to adapt at Chelsea. "It doesn't suit Rafa's book," he told BBC Radio 5 live's Sportsweek. "There was a very dysfunctional ownership structure at Liverpool for that period which gave him disproportionate power, perhaps the most powerful contract in professional football for a manager, a contract that gave him much greater power than the normal manager. "So I've got to say that when I saw him taking this job, going to a club where the reverse is true, on a temporary basis, no role in transfers, no total control, there wasn't a fit." Purslow joined Liverpool three months after Benitez signed a new five-year contract after winning a power struggle with former chief executive Rick Parry. He worked with Benitez for a year before the Spaniard left the club by mutual consent in 2010. Some people would say one needs to be a little more careful with those very senior pros. We all know that's true at Chelsea, it's been an issue with [Andre] Villas-Boas, Scolari. This was a tough brief for Rafa. In practise it doesn't feel like a good fit." The manager subsequently blamed Purslow for his departure from Anfield before embarking on a six-month spell with Inter Milan. 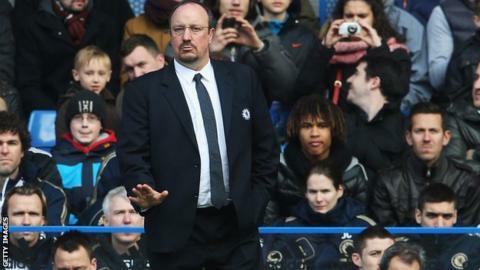 Benitez has always been unpopular with Chelsea's fans and after the 2-0 FA Cup fifth-round win at Middlesbrough, the 52-year-old hit out at a section of the Blues fans and claimed that his "interim" title was a "massive mistake". Purslow believes those comments were a calculated ploy by Benitez. He added: "I don't think it was a rant, I think it was planned, because Rafa plans everything. All managers are tricky when they're working with their executive team. They are used to being in charge, they want to be in charge. "Up until Tuesday I would say I've been quite surprised and impressed with the way he has kept a relatively low profile. "He does have form in the media in terms of outbursts, particularly against employers - Valencia, Liverpool, Milan it all happened. But I'd say he's been doing a pretty good job, slightly to my surprise. "I think he probably cares about these issues too much and focuses on them too much." Purslow also believes Benitez is not suited to working at a club where senior players hold a strong influence. Although John Terry has denied the claims, former manager Luiz Felipe Scolari has said that the Chelsea captain and the likes of Frank Lampard and Ashley Cole have too much power. Purslow said: "He feels very, very strongly that all players should be treated equally. In fact, I'd say that's almost a defining characteristic of his management strategy. "The reality is that's never true in any dressing room. You have senior pros, up and coming pros, people on their way out. "So perhaps some people would say one needs to be a little more careful with those very senior pros. We all know that's true at Chelsea, it's been an issue with [Andre] Villas-Boas, Scolari. "This was a tough brief for Rafa. In practise it doesn't feel like a good fit." Was Benitez doomed from the start at Chelsea? Read more on Was Benitez doomed from the start at Chelsea?